The recipe is pretty simple and very flexible, so do some flexing and add/subtract what sounds good to you. It goes without saying, cream of vegetable soup has got to be one of the best runner momma meals! 1-2 tsp seasonings: use what you like that goes with the veggie. I like an Italian mix I have that includes oregano, basil, marjoram, savory, sage. I like a little thyme and dill with asparagus. Spinach is lighter, so I just use a little tarragon with that. We love fresh ground black pepper in everything and fresh herbs from the garden can’t be beat. Toppings (optional): Finely chopped spinach or cabbage, sunflower seeds, grated parmesan or crusty bread, drizzle of olive oil. 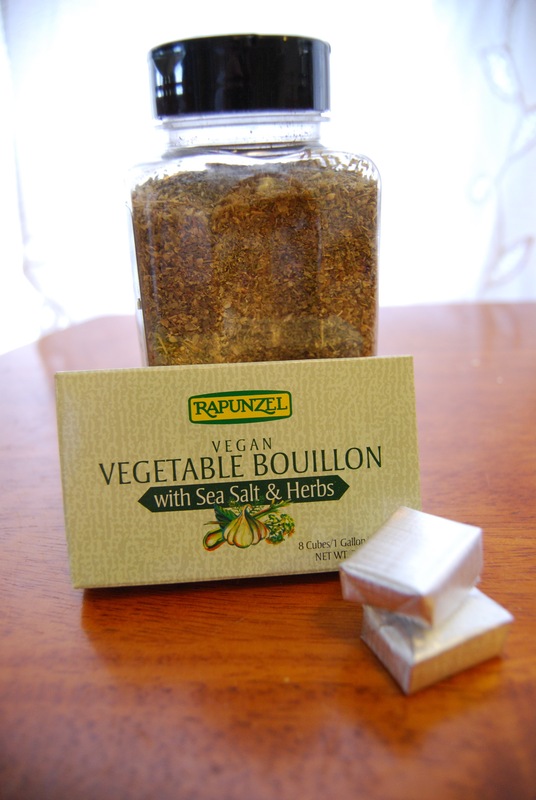 I like Rapunzel Vegan Veggie Bouillon. There’s no MSG which many bouillon cubes have. Heat oil in a dutch oven or large soup pot, cook onion till soft, about 5 minutes. While that’s cooking, add bouillon to water in a microwavable bowl (I use a big glass Pyrex measuring cup) and heat for 3 minutes. When water/bouillon is heated, whisk till it’s dissolved and set aside. Add seasonings to onion and stir for 15 seconds. Add butter and stir till melted. Over medium-high heat, stir in flour to form a roux (all sticks together). Slowly whisk in about 2 cups water-bouillon mixture until well blended and starting to thicken. Stir in the rest of the water mixture. Bring to a boil and boil 5 minutes. Add chopped vegetables and simmer till very soft when tested with a fork, about 10-15 minutes depending on the vegetable. *See note below about making cream of spinach soup. When veggies are soft, turn heat off and puree in blender (or use hand blender) until creamy. Pour soup back in dutch oven and adjust salt and pepper to taste. At this point, you can stir in up to a cup of milk if you want some “creamy” flavor. Taste it as you add it slowly. I’ve tried many kinds of milk in it because my son is somewhat lactose intolerant, but we figured out we like it without milk of any kind. Reheat on low until heated through. *Cream of spinach: I use about 5-6 cups baby spinach leaves when making cream of spinach soup (fresh large leaf spinach would work fine too, clean and chopped). Instead of adding it all at once, I add a cup at a time to the boiling water/onion mixture, stirring until each cup is limp, about 30 seconds each. Bonus- this is the quickest veggie soup evah and is a rich green – beautiful and fast when whipping up something yummy for company. Let me know how your soup turns out! I’d love to hear what you used to make it your own creation. How does running make me a better parent? Thanks for the recipe, Laura! In Chinese medicine we consider soup an ideal food. Deeply nourishing and nutritious. Thank you for all the great information you provide. You are an inspiration!